As flu season approaches, we find more and more facility managers reaching out to us to help them find the best method to prevent cross-contamination of germs and disease-carrying bacteria. Costly and persistent, contaminants can result in unhealthy environments, increased sick days, and guest aversion. 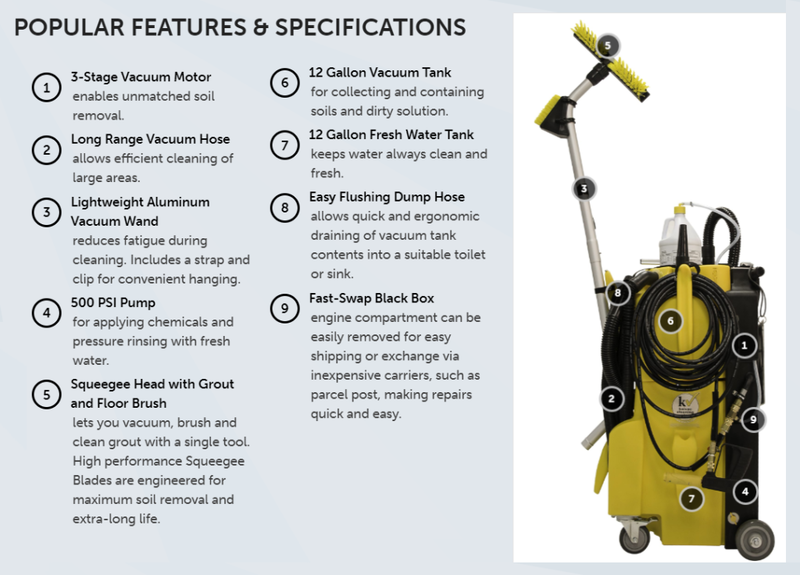 Kaivac’s powerful, multi-purpose system is equipped with a built-in pressure washer that cleans better than a basic mop ever could, even proven to be 60 times more effective at removing bacterial contamination. A simple, three-step process, our workers begin by spraying cleaning solution to the area, they then blast the soils to the floor with the high pressure spray, and finally they vacuum the area dry, completely removing soils, bacteria and other bio-hazardous contaminants. Learn more about preventing cross-contamination with this informative video from Kaivac. Ideal for germ-sensitive environments such as gyms, schools, medical facilities, food prep areas, and facilities with heavy traffic and public restrooms with consistent results. The spray and vac approach ensures the removal of contaminants and soils, rather than spreading – thus greatly reducing the risk of disease transfer. Kaivac is also excellent for tile and grout floors and walls – it can revitalize grouts via the pressure washing capability. Embedded soils and stains, the consequence of mopping, can be eliminated. Particularly relevant for high traffic restrooms where persistent odors can hide in porous grouts. Despite rigorous cleaning schedules, if the proper cleaning method is not being used, odors and stains will persist and worsen. Facilities deal with three kinds of dirt – loose, stuck, and embedded. Our approach is to avoid ever reaching the stage where dirt becomes stuck and embedded. With the proper methods and tools, we prevent the need for massive overhauls and costly restoration projects. Another benefit of the spray and vac approach is preventing slippery floors. All solution used by the spray is then vacuumed and floors are ready for use – effectively eliminating drying time. Compare to mopping, which can leave dampness and residues that create a slipping hazard. Consequently, this reduces the chemical exposure to workers and guests. Read more about the National Floor Safetey Institute’s recognition of Kaivac’s cleaning systems. Easy to maintain, easy to move, and easy to use. 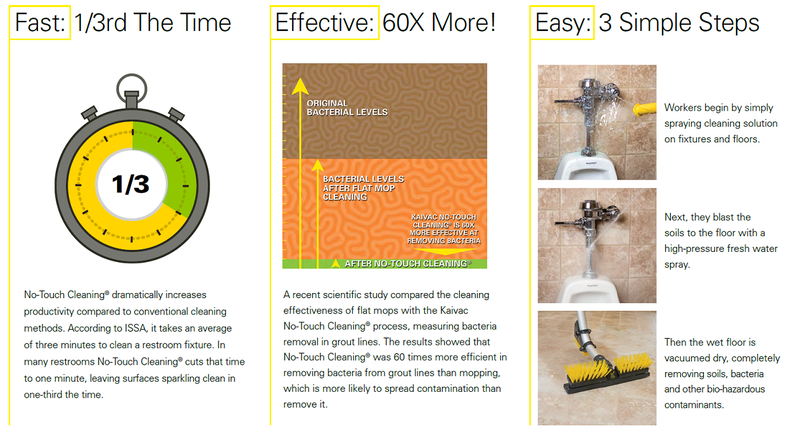 The Kaivac system offers solutions to complicated cleaning situations while being cost-effective and reducing labor time. These are savings that we pass on to our clients. In facilities where we have implemented the Kaivac cleaning systems, our clients have observed a marked improvement in the overall health and cleanliness of their facilities, as well as improved visitor and employee satisfaction. Visit Kaivac for more information! Hundreds of commercial, industrial, manufacturing and retail clients look to JanNet International for consistent quality service that meets their specialized facility commercial cleaning and maintenance. We provide custom facility solutions to sites of all sizes — from neighborhood banks and retail stores, to the largest and most complex facilities, such as corporate office parks and major transportation companies.